With the creation of DEEPMIND 12, the ultimate, true analog, 12-voice polyphonic synthesizer is finally a reality. DEEPMIND 12 allows you to conjure up virtually any sound you can imagine with unparalleled finesse and ease. Thanks to its 4 FX engines, dual analog OSCs and LFOs per voice, 3 ADSR Generators, 8-Channel Modulation Matrix and onboard 32-Step Sequencer, the DEEPMIND 12 gives you complete control over your soundscape. Plus, DEEPMIND 12 features comprehensive remote control via iPad*/PC/Mac and selected Android* Apps over USB, MIDI or built-in Wifi – for a custom-tailored workflow that lets your creative spirit soar to new heights! We also included 4 simultaneous FX engines with over 33 world-class TC ELECTRONIC, MIDAS and KLARK TEKNIK algorithms – including Reverb, Chorus, Flanger, Phaser, Delay, Multiband Distortion, and many more. Custom-designed and physically modeled after some of the most iconic and sought-after processors, DEEPMIND 12’s FX were essentially “rebuilt” in the digital domain – and put right at your fingertips. All effects run inside the low-latency environment of the DEEPMIND 12, ensuring flawless performance, flexible routing – and the end of cable faults forever! Playing chords and building textural soundscapes requires the ability to generate multiple notes or sounds simultaneously. While early analog synthesizers were either monophonic (only 1 note at a time), or somewhat limited in the number of sounds they could produce at the same time, the DEEPMIND 12 boosts your creativity with 12-note polyphony. Each voice has 2 oscillators, with OSC 1 generating sawtooth and square/pulse waveforms with pulse width modulation, and OSC 2 generates square/pulse waveforms with a unique tone modulation. With 24 oscillators at your disposal, a tremendous range of options becomes available. The addition of oscillator sync, oscillator drift and parameter drift allow the recreation of the much sought after warmth and movement from vintage analogue synthesizers, without the inherent unreliability and instability. Plus, the oscillators can operate in sync mode to expand the tonal palette dramatically. -Individual voices also have 2 LFOs (Low-Frequency Oscillators) with a range that extends into the audio rate. Each LFO has adjustable slew-rate, modulation delay, key sync, assignable clock sync (internal or external MIDI), envelope auto-triggering, as well as Delay and Fade in. The 7 available waveform shapes are; Sine, Triangle, Square, Ramp Up, Ramp Down, Sample and Hold, and Sample and Glide, for an amazing array of tonal options. The DEEPMIND 12 offers a highly unusual Phase Link option for the polyphonic LFOs allowing them to operate in Unison (Mono) or link with an adjustable phase shift between voices. The LFOs are also capable of tracking key pitch using the mod matrix, this allows for cross mod type effects. -When it comes to envelope generation, DEEPMIND 12 has all the bases covered, thanks to 3 four-stage ADSR (Attack, Decay, Sustain, Release) envelope generators per voice, each equipped with continuously-variable curves for truly unique flexibility. DEEPMIND 12 serves up all the versatility and tone-sculpting options a professional musician could ask for! The DEEPMIND 12 has 3 four stage ADSR envelopes per voice. Unusually each stage has a continuously-variable curves allowing for a great deal of enveloped flexibility. The DEEPMIND has very flexible envelopes being able to be triggered by Key, each LFO or control sequencer, additionally the envelopes can be looped well into the audio rate. -Want to modulate the reverb tail or compressor with the mod wheel? How about the drive of our Midas Multiband distortion with an LFO or aftertouch? you are only limited by your imagination with the modulation possibilities of the DEEPMIND 12. With 19 modulation sources and more than 130 destinations we have truly provided deep modulations options; with press and hold short cuts we've made selection of those sources and destinations quick and easy. DEEPMIND 12's modulation matrix expands your artistic creativity with up to 19 modulation sources that can be mapped to more than 130 destinations – even FX parameters! From the simple and sublime, to the outrageously complex, DEEPMIND 12's 8-channel modulation matrix provides virtually-limitless modulation options – all just waiting for your exploration. -The control sequencer features an adjustable slew rate, MIDI sync, and allows a 32-step pattern of values, which can vary from -127 to 127. Other parameters that can be controlled via the sequencer include: note value, tie and length; slew; and swing. These can all be mapped as modulation sources to any of the available destinations. The envelopes also have a mode to drive directly from the control sequencer. -Comprehensive remote control is available for DEEPMIND 12 via iPad*/PC/Mac and selected Android* Apps over USB, MIDI or built-in WiFi for extended parameter control. The iPad App also features a robust preset manager, gig list full editor and integral Patch Morpher*. 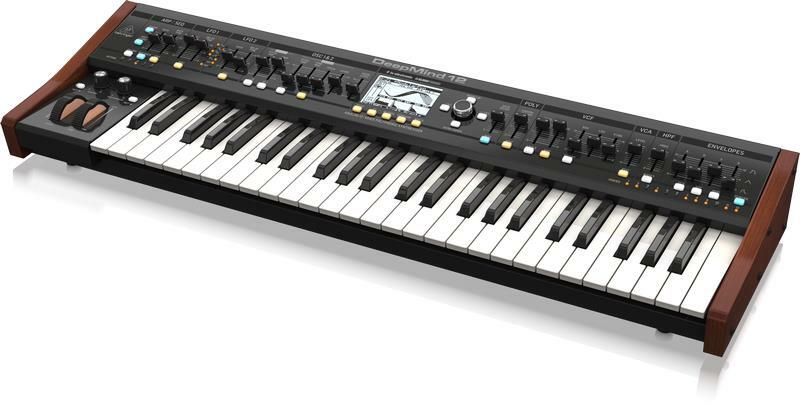 -The keyboard features 49 full-sized keys with velocity and aftertouch that deliver an expressive and superior playing experience. You’ll love the feel and playability of DEEPMIND 12’s semi-weighted keys as they respond to even the slightest nuance of your playing. Aftertouch allows you to imbue your sound with variations of pitch, volume, modulation or color – whatever parameters you choose. Whether you have a heavy or soft playing style, DEEPMIND 12 always responds to your touch with 3 different select-able velocity and aftertouch curves. 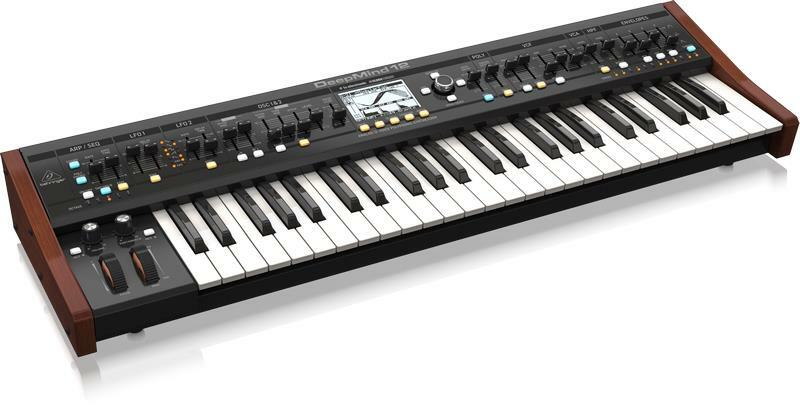 Add to this spring-loaded pitch and assignable modulation wheels, and you’ve got the ultimate hands-on live performance and studio-ready synthesizer. -A modern reincarnation of a beloved analog classic (with by-passable studio-grade FX), all of DEEPMIND 12's sounds are purely analog – all the way from OSC 1, which generates sawtooth and square/pulse waveforms with user-definable pulse width modulation (PWM) and OSC 2, which generates square/pulse waveforms with tone modulation. The combination of square/pulse on oscillator 1 and Tone Mod on oscillator 2 gives the DM12 a unique and fresh character unheard in current synthesizer architectures. -Everything about the DEEPMIND 12 has been designed to give you total control over the creative process, or as we like to call it... making music! That goes for the selectable, dual slope 12/24 dB analog low pass filter with adjustable resonance and tracking (per voice), and Envelope faders that smoothly transform individual segments of the envelope between linear, exponential and reverse exponential curves. Plus, you can use employ powerful unison and poly modes with detune, pan spread and drift parameters that can handle up to 12 voices per note for incredibly fat tones. And if you want even more, why not engage the global noise generator to dramatically expand your waveform options. DEEPMIND 12's extreme versatility empowers you to be your creative best! There are a lot of amazing features in the DEEPMIND 12 that are virtually unheard of in this class, including several that really deserve being called, "special". While most synthesizers only allow mono portamento glides, the DEEPMIND 12 lets you create stunningly smooth mono and polyphonic glides that will really get your juices flowing! Plus, you get 33 studio-grade effects designed by some of the world's best sound designers ֠all of which can be modulated, thanks to the flexible 8-channel modulation matrix with 19 sources and over 130 destinations. A very sophisticated Arpeggiator is also provided, complete with a tap tempo button and user-configurable pattern modes that exhibit a level of refinement previously only available from a sequencer. Another powerful feature allows you to write extremely complex polychords into memory locations ֠and then perform them with the press of a single key. And if your creation calls for room-shaking bass lines, you're gonna love the boost switch on DEEPMIND 12's variable 6 dB high pass filter. Add to this unison and poly modes with detune, pan spread and drift parameters for up to 12 voices per note ֠and you've got the tools to tap into your full potential. It's what separates the DEEPMIND 12 from the competition! -We can't help ourselves ֠like you, we're gear-heads, too! For those who want the numbers, DEEPMIND 12 has: 26 sliders; 33 switches, 1 rotary encoder, 2 knobs, 1 spring-loaded pitch wheel and 1 assignable, spring-loaded modulation wheel. All are laid out in a highly-intuitive format designed to put the joy back into your music creation. The large and easy-to-read LCD screen provides rapid parameter editing and program selection on-the-fly, for a total hands-on performance with real-time access to all important parameters. -The patches loaded into DEEPMIND 12's memory were design by some of the world's finest sound designers, and all of them are available for your modification. Your parameter settings can be stored in one of 1024 available user memory slots, which feature a convenient ԣompare and matchԠfunction that helps you match all analog controls to the values stored in the program. DEEPMIND 12 provides more than enough memory to store several soundtracks ֠and even entire shows! -DEEPMIND 12's connectivity is extensive with: fully servo-balanced stereo TRS outputs, for audio feeds to mixing consoles/amplifiers; Phones; Sustain; Pedal/CV; MIDI (In, Out, Thru), for external devices and your DAW; and MIDI USB for your computer and firmware updates. The comprehensive MIDI implementation includes NRPN/CC control of nearly all parameters and bulk load/save.